I’ve been running mastermind groups since 1995, and I’ve seen groups of all sizes. Some as small as four and some as large as 150. However, there is an ideal size for your group. How much total time is available at each meeting? Meetings need to have to begin and end on time, and many meetings that run over 90 minutes can run out of steam without frequent breaks. Yet breaks also cause interruption of the energy levels. So first decide how long each meeting will be, then go on to Question 2. 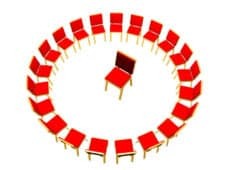 How much time should each member get to be in the Hot Seat to talk about their problem, challenge or decision? Members need time to first verbalize their situation before masterminding can begin in earnest. Some members are quick and can sum it up in five minutes or less. Others need 10-15 minutes just to set the stage. Then you need time to brainstorm after that. What other items are on your agenda? Remember that your meeting typically includes some sort of opening and closing, as well as possible guest speakers, training or other events. Allow time for those in your mastermind group agenda, then plan accordingly. So, what’s the ideal size of group? In my mastermind groups, I tend to look for 4-8 members per group. Less than four and the energy level can drop (though I know several very successful mastermind groups with three members in them! ), and more than eight members will probably cause you to run out of time. However, if you’re doing half-day or full-day meetings, you may be able to include more members. First choose your times and your agenda, then figure out how many members can fit into that structure. But what about those larger groups? This article is very helpful. I hope to create my own mastermind groups. I think you started my mastermind group with six people. Almost five years later, we’re down to four, but still going strong. My experience is that members appreciate the time pressure, in order to feel efficient and keep the energy high. Without the structure it certainly goes over 30 minutes, but it doesn’t add more quality than when we’re keeping it to 15-20 minutes. The facilitator is the key though, and it sometimes is an interesting challenge to find the right time to interrupt. Our group has 8 members, we spent 4 hours together. After every 2 hotseats a short break. For me as well as the group, it’s the max. That’s interesting, Marja, and ties in with what many people tell me in general: If there’s a time limit on something, we become more efficient and succinct in order to get done whatever needs to be done within that short time period. The only time I see long Hot Seats work well is if we’re working on big picture strategy or big project planning. Then it’s important to have the time to work through the thought process, the decision making, and the action planning. But we usually do those types of long Hot Seats during yearly mastermind group retreat weekends, not during normal meetings. Hi Karyn. I have just discovered this mastermind concept and now I m thinking of starting this mastermind idea with my own family…with my three daughters and me. I will start this week. That’s a great use of a mastermind group, Marica!